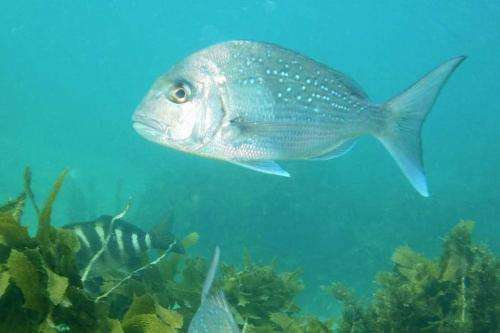 The new study led by scientists from Massey University's Coastal-Marine Research Group (CMRG) has estimated the effects of three Hauraki Gulf marine reserves on snapper, by comparing numbers of fish inside and outside reserves. "Have you ever wondered what our coastal underwater world would look like if we didn't fish?" asks Massey lecturer and PhD candidate Adam Smith. "Marine reserves—areas that are closed to fishing—can provide some idea: they're teeming with huge fish!" The study of three marine reserves in the Greater Hauraki Gulf region estimated there are between eight to 20 times more large snapper (above the legal size limit of 27 cm) in reserves than in nearby areas where fishing occurs. "In other words, if there were, say, 10 large snapper per hectare outside a reserve, there could be up to 200 per hectare inside the reserve," Mr Smith says. "In contrast, there was no effect of marine reserves on snapper under the legal size limit." He says that estimating snapper numbers is not easy. "Snapper are generally shy of scuba divers, except in marine reserves where they're used to being fed, so the usual method of counting fish on scuba was not appropriate for this study." Instead, fish were counted using "baited underwater video" where a video camera is aimed at a box of bait for a fixed length of time. The maximum number of fish seen in one frame is then used to ensure that the same fish is never counted twice. Data from fish counts are notoriously difficult to analyse. They are often hugely variable and contain a large number of zero counts, defying the more traditional statistical approaches. Fortunately, such challenging statistical analyses are the speciality of the growing team of marine scientists at the Albany campus. "Novel statistical methods developed for this study allowed us to produce the most accurate estimates of New Zealand marine reserve effects to date. We hope these methods will be picked up by other ecologists around the world who encounter similar issues," says Mr Smith. "As a wise colleague once said, 'counting fish is like counting trees, except you can't see them and they move'." The biggest effect size (near 20 times) was observed in New Zealand's oldest reserve, the popular Cape Rodney-Okakari Point (Goat Island) Marine Reserve near Leigh. The estimated effects of the other reserves studied were eight times at Tāwharanui and 16 times at Whanganui A Hei (Cathedral Cove). The average effect size across reserves was 13 times. Possible reasons for the varying effects of the three reserves include differences in reserve size, habitat, and how well the reserve was enforced. Large, well-enforced reserves in good habitats are crucial to their success. This research is timely, as marine spatial planning of the Hauraki Gulf is currently underway and new marine reserves are likely to play a key role. As well as being a proven drawcard for ecotourism, marine reserves have a wide range of potential ecological benefits. Snapper, along with crayfish, which also benefit from being in reserves, are important predators of kina (sea urchins). Kina graze on kelp and can reduce kelp forests to bare rock (known as "kina barrens") if populations are not kept in check. Large snapper and crayfish can sufficiently reduce kina to allow regrowth of the ecologically-important kelp forest, a phenomenon known as a "trophic cascade". Another benefit is that big fish have big reproductive output. Large numbers of hefty fish in marine reserves can act as reproductive reservoirs, re-seeding surrounding areas with adult fish and larvae. The contribution of reserve fish to recruitment in fished waters is the subject of ongoing research. While burgeoning populations of big fish in reserves have a range of important ecological functions, Mr Smith reflects on a much simpler benefit of marine reserves. "Marine reserves provide an amazing wildlife experience for anyone keen to don a mask and snorkel and jump in the water. Our coastal waters are teeming with life, especially in marine reserves. Seeing first-hand what our coastal ecosystems used to be like is a privilege and a truly unforgettable experience." Mr Smith led the study as part of his PhD, alongside Professor Marti Anderson from Institute of Natural and Mathematical Sciences. The research covered three marine reserves in the Greater Hauraki Gulf region and was funded by funded by the Department of Conservation. It was recently published in the international journal Marine Ecology Progress Series.